ACTON, MA U.S.A. (February 13, 2019) – Wintriss Controls Group has announced it will be introducing ShopFloorConnect® 6.0 OEE and Shop Floor Data Collection Software at EASTEC 2019, Booth 5668 located at Eastern States Exposition, West Springfield, MA from May 14 - 16, 2019. https://www.wintriss.com/sfc/. ShopFloorConnect® gathers production data from every machine in the factory, displays the Key Performance Indicators (KPIs) in real-time, and produces detailed analytics, including comprehensive OEE reports in a variety of formats. The software can significantly increase manufacturing capacity and profitability by identifying and quantifying excessive production losses and bottlenecks. "Automatically collecting important efficiency and downtime machine data results in on-time, accurate reporting while removing subjectivity," said Mr. Keith Magnant, ShopFloorConnect Sales Manager. "Our ShopFloorConnect software provides an extremely easy-to-use, efficient data collection solution which can reduce machine downtime by up to 70%." This scalable and flexible production monitoring system is compatible will all ERP software so it is well-suited for manufacturers in a variety of industries, including packaging, food, beverage, discrete manufacturing, metalforming and metal fabrication. 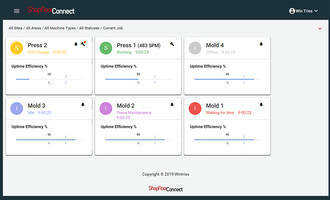 ShopFloorConnect® provides superior OEE calculations that accurately report overall equipment effectiveness for even the most complex manufacturing environments. The production tracking software provides machine downtime and manufacturing efficiency reports via a web browser and email, and integrates with existing systems. ShopFloorConnect® is a shop floor data collection system from Wintriss Controls Group of Acton, MA. Wintriss has been manufacturing and installing electronic controllers on industrial machinery for over 60 years, developing its first downtime data collection and efficiency reporting software product in 1985, and continuously improving it ever since. Wintriss has a unique skill set: Not only do we provide a robust and scalable OEE reporting product and an on-machine production tracking solution that is simple to install and user friendly, but our vast industrial controls experience gives us the expertise to seamlessly adapt the technology to customer machinery. For more information on ShopFloorConnect® software and Wintriss, visit https://www.wintriss.com/sfc/ or contact ShopFloorConnect® - Wintriss Controls Group at 100 Discovery Way, Unit 110, Acton MA 01720, phone (800) 586-8324, Fax: (978) 263-2048.